(14-LP + Manufactured for the world at Optimal Media in Germany, The Beatles' albums are presented in their original glory, both sonically and in their packaging. The boxed collection's exclusive 12-inch by 12-inch hardbound book features new essays and a detailed history of the mastering process by award-winning radio producer and author Kevin Howlett. The book is illustrated with many rare studio photos of The Beatles, fascinating archive documents, and articles and advertisements sourced from 1960s publications. 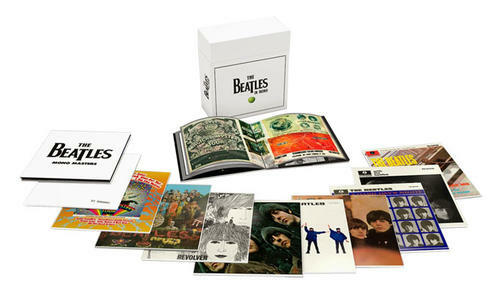 Albums included in the box set are: Please Please Me, With The Beatles, A Hard Day’s Night, Beatles For Sale, Help!, Rubber Soul, Revolver, Sgt. Pepper’s Lonely Hearts Club Band, Magical Mystery Tour, The Beatles, Mono Masters.